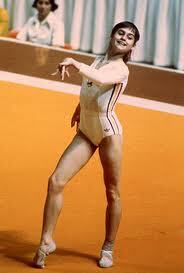 Nadia Comaneci (Nadia Elena Comãneci) (born Nov 1961) is an Olympic Gold Medal winning athlete. A female gymnast born in Romania and trained by Bela Karoloyi, she was only 14 years old when she received the first "perfect 10" score in Gymnastics in the 1976 Olympics, held in Montreal, Canada. Nadia now lives in the United States and is married to American Olympic athlete Bart Conner. This page was last modified on 26 September 2018, at 13:40.